Hi there! Did you have a chance to stop by yesterday for the first post of the season? I shared my favorite ways to decorate with velvet pumpkins! You could totally use the tips and tricks with any pumpkins. I wanted to continue the early Fall theme with more decorating ideas today. I hope you are having as much fun as me anticipating cooler weather, Autumn hues, and cool summer evenings around the fire pit. An eclectic modern wreath with a brass animal. This is a great DIY for an unused frame (with missing glass). Shop the house for accessories to give it glam! Love these little plastic dollar store pails. Turn them into a fancy planter with this simple DIY. A fun upcyle DIY using wrought iron wall art. These wall decor pieces are so inexpensive and you can transform it into something gorgeous and chic with this tutorial. 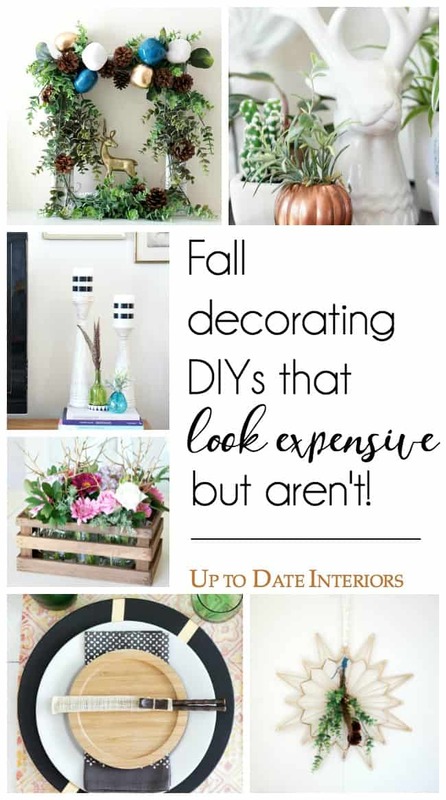 DIY large artwork for Fall. Dollar store copper mini pumpkin accents. Another pumpkin pail DIY for a pretty centerpiece or use as accents in your Fall vignette. Two quick and simple DIYs: First, use feathers, yard clippings, or faux sprigs in colored glass bud vases. This gorgeous, full pinecone wreath would cost upwards to $100 or more but with a little time and a glue gun, make it yourself for next to nothing with these tips and tricks. Watercolor Autumn art in a jiffy. Print out this free watercolor pumpkin printable to add to your seasonal decor. It’s available in different sizes and with various options. Feather art for a little boho fun! Check out a DIY video and step by step instructions for drawing a feather. An easy way to update an old sign for Fall. Modern moss wreath for pennies. This sweet wreath’s supplies are all from the dollar store. You can find the moss wreath DIY here. Black and gold chargers upcycle. Use this simple DIY to give your chargers a modern pop! Perfect for a Autumn table setting or corralling candles on your coffee table. A floral Autumn centerpiece with a touch of farmhouse. I like to call these types faux real! It’s a mix of silk flowers with yard clippings and faux sprigs and thorns. Find the full DIY here. Do you have a favorite? I’m having fun using some of these in our new traditional Japanese rental. Check out these similar posts!! All fabulous ideas Kathy!!! Still adore those copper pumpkins!